Sonos and IKEA might make music-playing shelves | What Hi-Fi? It's called Symfonisk - and it could be the future of Sonos. Sonos products have quite simple names: the One, the Playbar, the Playbase and, most recently, the Beam. IKEA products, well, do not. Fyrakantig, for example. Or Hemnes. So we'll let you decide who won the marketting battle with the companies' first collaborative product: the Symfonisk. 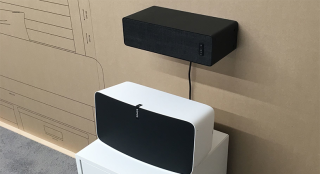 The Symfonisk is a wi-fi speaker that can be "integrated with the home furnishing overall" by way of brackets allowing you to use the speaker as a shelf. Now, you might very well think any speaker bolted to the wall could potentially be a shelf if you put things on it. We couldn't possibly comment. Nevertheless, the Symfonisk was demonstrated at IKEA's annual Democratic Design Days conference in Sweden, and is due to be released in second half of next year. It will, happily, also link with other Sonos products. The Symfonisk on show is only an example, so the finished product might look a little different. It's also a non-working unit, so we don't yet know how it will sound. Yet this could be a good move for Sonos. There are only so many rooms that can be filled with wireless speakers or soundbars until you need to buy a bigger house, and when they sound as good as Sonos speakers do there's rarely a reason to upgrade. Having hi-fi built into the furniture from the off could see the company build a whole new ecosystem of products. Should the smarthome - with internet-connected lightbulbs, televisions, and other white goods (like LG is trying to make) - come to fruition, here is where Sonos seems to be carving its futuristic niche. Sonos Trueplay: What is it? How can you use it?